A Sacred Heart of Jesus rosary chaplet. Prayer instructions will be included. 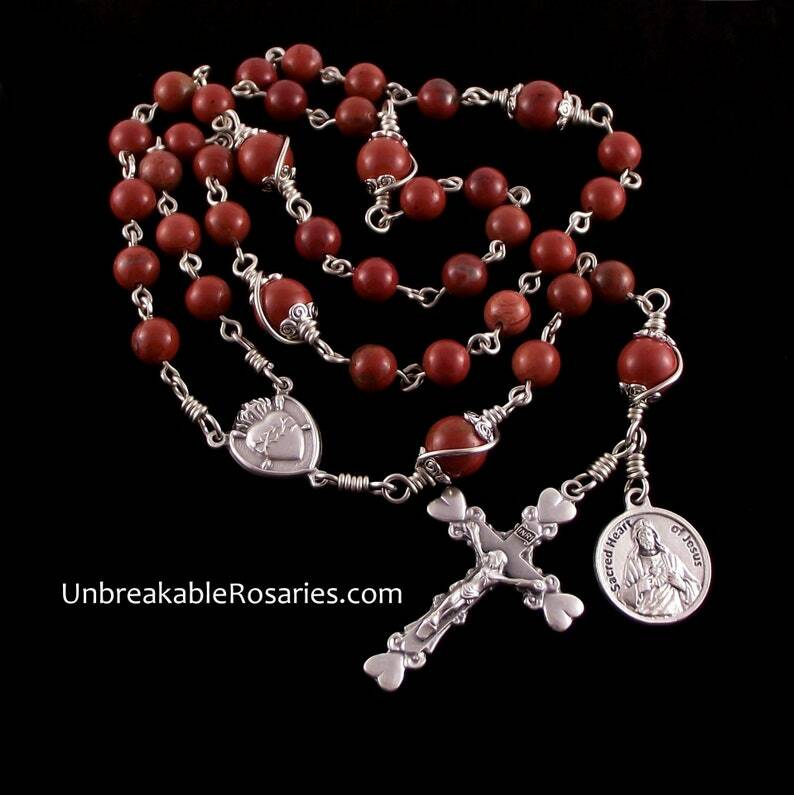 All of my rosaries - should the construction break during normal prayer - may be returned at any time for free repairs. Beads: 8mm and 10mm Natural red jasper. Configuration: 5 sets of six beads each, three on the drop, centerpiece, crucifix, and Sacred Heart medal. Center: 3/4" Thorned Sacred Heart medal with Our Lady of Sorrows on the back. Made in Italy. Crucifix: Four hearts Italian crucifix. Measures 1.75" high by 1.25" wide. Medal: 3/4" Sacred Heart of Jesus medal. On the back: "With Jesus in my heart I can do anything ..."
Construction: Chain link with wire-wrapped Pater beads and connection points. Another fantastic and well crafted chaplet .. They are built durable and can with stand Even the most the prayerful Warriors .